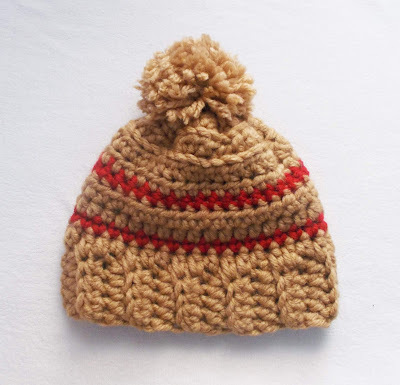 Here is the written pattern of the cozy "Camel Beanie". The removable pop pom make it really special, cause you can put it on or get it off of it. That's depends of your everyday mood. Wear it and feel its coziness for the first time. 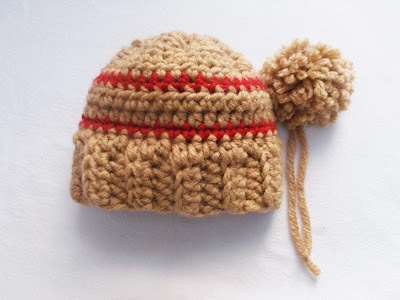 It's a simple crocheted pattern, but the result will make you fell happy and proud! 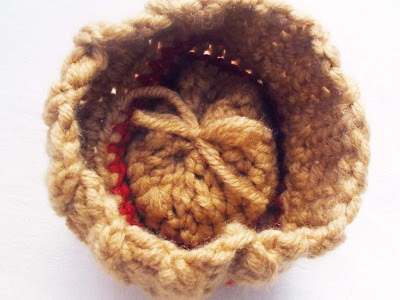 Get your crochet hook and start right now!! Ch 2 and turn your work horizontal. Crab 36 stitches all across by working hdc. Round 1: Sc into 1st st and in every st all around (*note: don't work last st, cause we worked from the 1st), sl st to close the round, change color to Camel, ch 1. Round 2: Hdc into 1st st and in every st all around (*note: don't work last st, cause we worked from the 1st), sl st to close the round, ch 1. Round 3: Hdc into 1st st and in every st all around (*note: don't work last st, cause we worked from the 1st), sl st to close the round, change color to Red, ch 1. Rounds 7 - 8: Hdc2tog(FLO) from 1st st, hdc(FLO) in every st all around (*note: don't work last st, cause we worked from the 1st), sl st.